Bad breath, or halitosis, can be caused by a number of factors. Having bad breath can be embarrassing and cause sufferers frustration and anxiety. According to the Mayo Clinic, some of the potential causes of halitosis include certain foods, health conditions and oral diseases. The treatment of halitosis usually is relatively simple depending on the cause. Toothpastes, mouthwash, floss and regular dental care can help to relieve symptoms of bad breath. Apple cider vinegar is a folk remedy that some people believe can also help to ease bad breath. Take one tablespoon of apple cider vinegar before a meal. You can also dilute the vinegar in a glass of water. The vinegar will help your body digest its meal, and cure bad breath. Drink one tablespoon of apple cider vinegar after each meal. If you cannot tolerate the vinegar on its own, mix one tablespoon of the vinegar with an 8-oz glass of water. Gargle with apple cider vinegar. Add ½ tablespoon of vinegar to a cup of water. 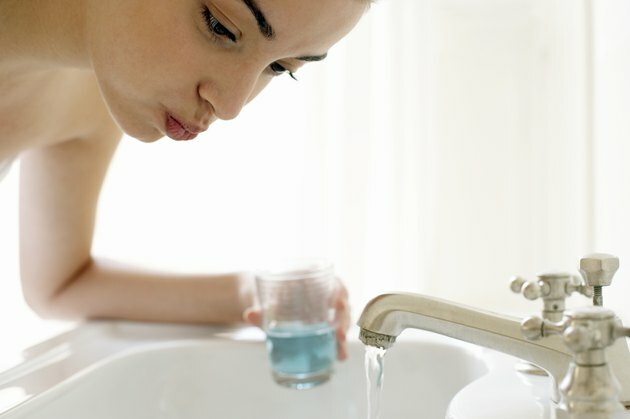 Gargle for ten seconds instead of mouthwash after meals to cure bad breath. Home Remedies Web: What is Apple Cider Vinegar?